Former Ivorian president Laurent Gbagbo appearing at the International Criminal Court in The Hague (file photo). Former Ivory Coast President Laurent Gbagbo and his right-hand man had been acquitted of crimes against humanity. But they will have to stay in custody until the court evaluates an appeal by prosecutors. The International Criminal Court on Wednesday halted the release of former Ivory Coast President Laurent Gbagbo, after prosecutors filed an appeal to keep him in custody on charges of crimes against humanity. Judges on Tuesday ordered Gbagbo and his right-hand man, Charles Ble Goude, to be immediately freed after clearing them of any role in a wave of post-electoral violence in 2010 and 2011 that killed 3,000 people. But prosecutors have submitted an appeal and the pair will have to remain behind bars while the ICC evaluates it. 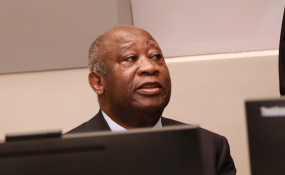 "Pending the decision of the appeals chamber on this prosecutor's request ... Mr. Gbagbo and Mr. Ble Goude shall remain in ICC custody," an ICC spokesman said. Prosecutors said there is a risk that if released now, Gbagbo and Ble Goude will refuse to return to face justice if the court later decides to overturn their acquittal. The pair can also appeal but this must be done before 1100 GMT on Thursday. Gbagbo and Ble Goude have been on trial since January 2016 over the bloodshed that gripped the former French colony after Gbagbo refused to admit defeat to current President Alassane Ouattara in a presidential vote. Gbagbo has been behind bars since 2011 when he was captured by Ouattara's troops, aided by UN and French forces, and sent to The Hague. In Ivory Coast, Gbagbo still faces a 20-year jail term for "economic crimes" imposed by a local court last year.